With beetroots in season at the moment, you’re probably seeing them pop up in shops and supermarkets everywhere. It’s like we’re experiencing a mass invasion of the little blighters. Beetroot juice, beetroot crisps, beetroot brownies, beetroot hummus… It’s like the world only recently (but very enthusiastically) just discovered the things. It was in response to this glut of beetroots spilling off the shelves of my local shop that I decided to bang together this soup. With beetroot being credited with lowering blood pressure, increasing stamina and improving blood flow, there’s never been a better reason to add them to your five a day! (Oh, and there’s also the fact they’re great for your liver if you need to detox, or even if you just want to help recover from a heavy weekend). This soup looks smashing. Its bright, bloody pink colour adds a bit of “wow factor” to a lunch for friends or as a dinner party starter… If I do say so myself. The sour cream and chive garnish packs a serious punch and adds a nice smack of flavour. 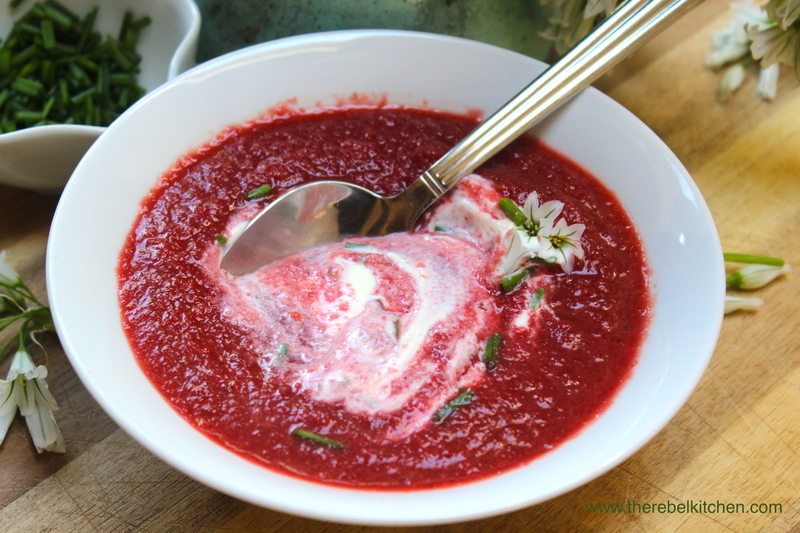 Beetroots taste quite earthy so the sharpness of the sour cream garnish really complements it… So don’t skip it! I added a few wild leek flowers to my garnish but you don’t have to, I just have them growing all around my house and so have been throwing them into everything! 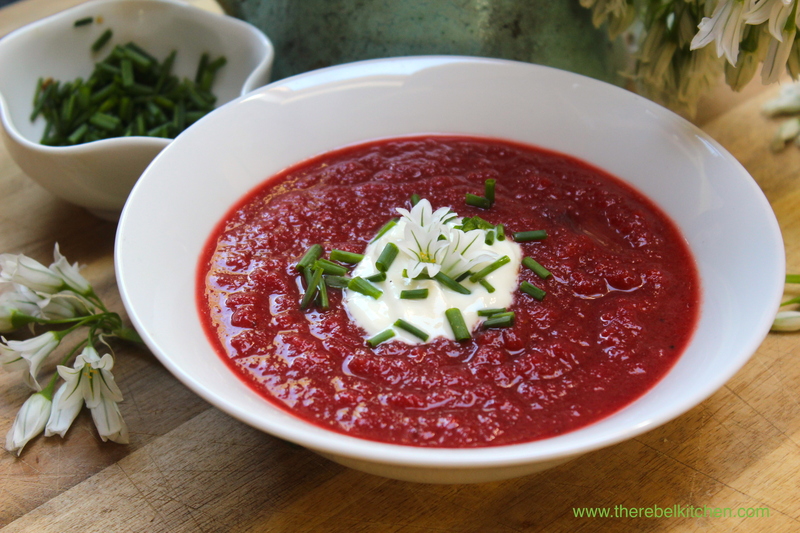 Try this recipe out to make the most of the current beetroot season, and if you have any ideas for other beetroot recipes let me know in the comment section below. Chop your beetroot into rough cubes and chop your carrots, add to a roasting dish with some oil & salt and roast until cooked through. Wear some gloves when chopping the beetroot unless you’re happy to have red nails for the next week. In a large soup pot add the finely chopped garlic and grated ginger to some oil, gently fry for a minute or two. Add the chopped onion and apple to the pot and cook for another few minutes before adding the roasted veggies. Add in your stock and let the pot hum away for 20 minutes on a medium heat until all veggies are soft. Blitz with a hand blender (watch out for sprays of boiling soup… Never pleasant) until completely smooth. Have a taste and add salt and pepper (or even some apple cider vinegar) as needed. 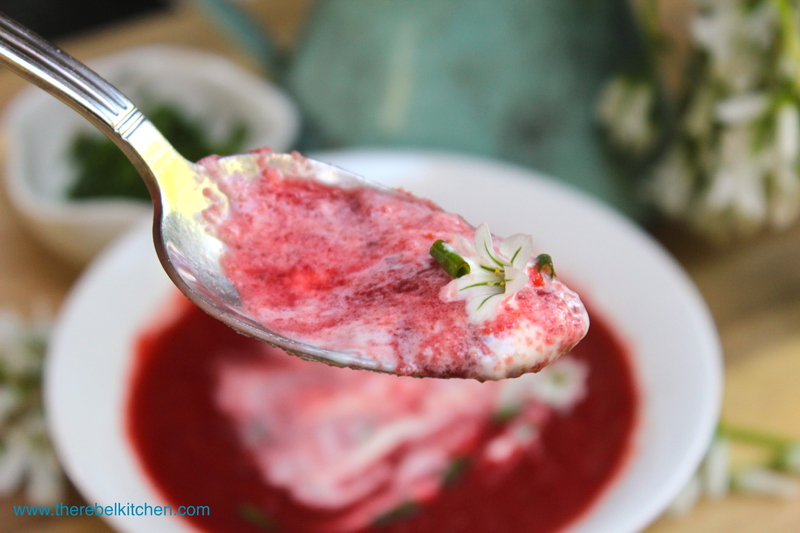 Serve in warm bowl with a dollop of sour cream and a generous sprinkling of chives. Eating Your Five A Day Has Never Been So Appealing! That looks fantastic! 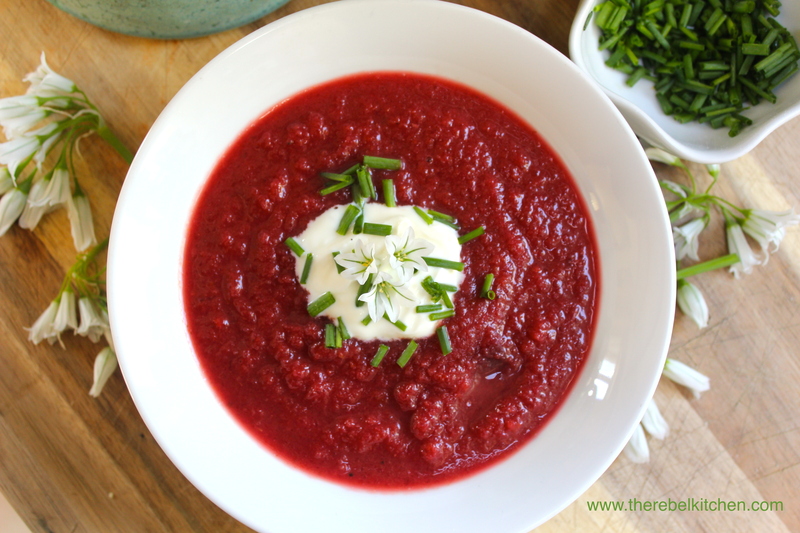 Almost a traditional Ukrainian Borscht, although you’ve clearly made it your own with an apple and ginger twist… which I’m definitely going to steal. As for interesting beet recipes, I’ll share 2 of my favorites. The first is a beet salad. Cook a few beets and parsnips according you your preferred method (I boil and steam them respectively), let cool, and slice them into fork sized bits. Throw in a handful of walnuts, a diced apple, and your favorite brand of soft goat cheese. Spread over a bed of sprouts and/or parsley. Drizzle olive oil and Balsamic Vin over the top, and garnish with orange zest. The second is one of my favorite “show off” foods for adventurous eaters. Blitz up some cooked beets (I generally oven roast when doing this) and add them to a typical ravioli recipe to make a gorgeous red pasta dough. (may need an extra egg). You can stuff the beet ravioli’s however you wish… You can fill the raviolis however you wish, but in this case I’m going to say fill about half of them with Ricotta cheese and mint. Fill the other half with a pork shoulder that’s been slow cooked in apple cider vinegar. For the sauce I use melted butter, some crushed garlic, and a tiny squeeze of lemon juice. Thanks for the ideas, I love the idea of the beetroot pasta. I must try that next time I make some 🙂 Especially stuffed with ricotta… Drool!